NEW ORLEANS – While it might officially be spring on the calendar, that doesn’t mean that the entire country has thawed out just yet. 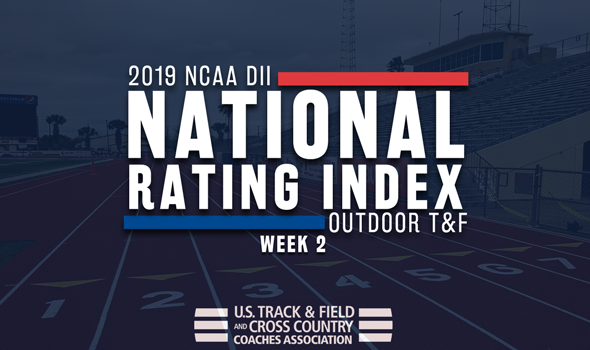 But you can start to see it move that way as a combined 81 new schools joined the latest edition of the NCAA Division II Men’s and Women’s Outdoor Track & Field National Rating Index which was released by the U.S. Track & Field and Cross Country Coaches Association (USTFCCCA) on Tuesday. The men and women from Angelo State are the top teams in the country, which is the first time that the same men’s and women’s program held the top spot in the ratings since UC San Diego accomplished the feat in the Week Two rankings of the 2016 season. Remember to keep checking back weekly as more programs will find their way into the mix. Some regions throughout the country still have yet to kick off their outdoor seasons, which will bring a ton of movement before the 2019 NCAA Division II Outdoor Track & Field Championships set for May 23-25 in Kingsville, Texas. The next National Rating Index for both men and women will be released on Tuesday, April 2. Angelo State moved into the top spot in the latest edition of the TFRI, the first time at No. 1 since Week 2 of the 2016 season. The Rams have already competed in three meets so far this outdoor season, which included this past weekend’s Texas A&M Kingsville Cactus Cup. The top performance from the weekend belonged to Matthew Walsh who posted the fourth-best mark in the triple jump so far this outdoor season. Other top contributors this season include Decio Andrade (first in the nation in the hammer throw) and Trivett Jones (third in the pole vault). The program’s 4×100 unit is also third in the country while their 4×400 group comes in at fourth overall. Jumping up one spot into No. 2 was Embry-Riddle (Fla.) which is the new high-water mark received by the program. The Eagles have also had athletes at three meets to start the outdoor season and saw its 4×400 unit post the fifth-best mark in the country at the North Florida Spring Break Invitational. Other top performances so far this season belong to Calahan Warren (first overall in the 1500 and second in the 800) and Brodie Lubelski (first in the shot put and eighth in the discus). Lee (Tenn.) jumped up two spots to also set a program record for best mark received as they came in at No. 3 overall. The Flames have had two meets so far during outdoors but spent the weekend off from competition. Top athletes from the program so far have been Justin Brooks (tops the nation in the 400 and seventh in the 200), Christian Noble (first in the steeple) and Josiah Brooks (third in the 200 and seventh in the 100). Moving up five spots to No. 4 was Saint Augustine’s after posting some of the best marks in the country across respective events this past weekend at the HPU VertKlasse Meeting. Best performances of the weekend went to Darren Alfred (third in the nation in the 400), Brandon Parris (fourth in the 400) and Nathan Fergusson (fourth in the 400H). The three join previous showings by Najair Jackson (third in the javelin) and the group’s 4×400 unit (tops in the country). Academy of Art improved two spots up to No. 5 to post its best mark since the opening rankings of the 2018 season. The Urban Knights have competed at two meets so far during outdoors which included this past weekend’s San Francisco State & Academy of the Art Dual Meet. Top showings of the season have gone to Mobolade Ajomale (leads the nation in the 100 and 200), Freddie Hessian (second in the 1500), Charlie Messai (fourth in the 1500) and Daniel Cortes Gonzalez (fourth in the high jump). The top-10 was completed by Chico State, West Texas A&M, UC San Diego, Texas A&M-Commerce and Cal Poly Pomona, in that order. West Texas A&M had the largest gain in the index this week as the program jumped up 83 spots from its previous position a week ago. Other large improvements were seen by No. 26 UPR Mayaguez (up 57 spots), No. 29 Limestone (up 41) and No. 39 North Greenville (up 38). For the second consecutive week Angelo State remained as the top team in the nation to kick off the outdoor season. The Rams have attended two meets so far to open the outdoor campaign, including this past weekend’s Texas A&M Kingsville Cactus Cup which saw strong performances out of Daisy Osakue (third in country in the shot put) and Hannah Porter (fifth in the 100). They join Osakue (also first in the discus), Karlea Duhon (first in the heptathlon), Kaitlyn Matthews (fourth in the triple jump) and Talena Murray (fourth in the javelin) as early-season standouts. It is the first time that Angelo State has opened the outdoor season as the No. 1 squad in back-to-back weeks since 2017. Moving up two spots to No. 2 was SF State. The Gators have had athletes take part in three meets so far during outdoors which included its San Francisco State & Academy of the Art Dual Meet this weekend. Top performances of the weekend were had by Destiny Mack-Talalemotu (fourth in the nation in the hammer throw) and Courtney Massengale (fifth overall in the discus). The showing will get added to other strong starts already had by Timarya Baynard (second in the 400) and the group’s top-ranked 4×100 and 4×400 units. Dropping one spot to No. 3 was Azusa Pacific. The Cougars have also competed in three meets so far this season with the most recent being this past weekend’s UC-Riverside Spring Track Classic which saw Elle Alexander post the fourth-best mark in the country in the discus. She joins Abigail Gray and Sara Wagenveld (both third in the country in the pole vault) and Elise Larson (fourth in the 5000) as early season top performers. Coming in at No. 4 after a nine-spot improvement was West Texas A&M after a solid weekend at the Fearless Champion Open, the program’s second meet of the outdoor season. Standouts from the weekend include Zada Swoopes (first in the nation in the shot put) and Cayli Yarbrough (second in the high jump) to go with the group’s 4×100 unit (fourth overall). Completing the top-five after a two-spot decrease was No. 5 UC San Diego. The Tritons spent the past weekend at the 41st Annual Aztec Open and Invitational where they saw Claudia Cox post the best time in DII in the 400H this season with Kelly Strand right behind here at third overall. Natalie Caraway also posted the fourth-best mark in the high jump. The rest of the top-10 was rounded out by Seattle Pacific, UC-Colorado Springs, Academy of Art, Ashland and Fresno Pacific, in that order. The largest leap in the rankings this week went to No. 16 Simon Fraser who shot up 84 spots from the previous poll. Limestone (No. 17 in the country) was right behind them after a 81-spot improvement. It is the best mark received by Simon Fraser since Week 3 of the 2017 season and is the first time that Limestone has appeared in the ratings in school history. Other big improvements were taken by No. 31 Texas A&M-Kingsville (up 68 spots) and No. 40 Paine (up 49).